MISSION, KS--(Marketwired - Dec 7, 2015) - (Family Features) If you've been entrusted to assist an elderly relative with scheduling preventive exams and putting a health care plan in place, you may struggle with knowing when it's time to take on a greater role in other aspects of their life. That's why now is the perfect time to look for warning signs that your loved ones might be suffering from a decline in financial ability. Despite years of accumulated knowledge and experience, it is likely that at some point your loved ones' financial capability will be challenged as they age, making it more difficult to competently handle money-related matters on their own. And this decline can occur even if illnesses, such as Alzheimer's or dementia, are not present. Establishing a plan to manage your parents' finances is an important task in their senior years, particularly if you intend to engage other family members in the process. A survey from the National Endowment for Financial Education (NEFE) found that 86 percent of people want their family to help with financial matters if they become unable. However, nearly 7 in 10 say their family dynamics prevent that from happening. According to the survey, 58 percent of families experience disagreements, conflicts or confrontation with others when aging affects financial decision making. Whether you're a child or family member who has been enlisted to help or even charting your own financial future, approaching these discussions with candor and an open mind is critical. "Especially if you're accustomed to handling money matters privately, learning to talk more candidly about your finances may be uncomfortable," said Ted Beck, president and CEO of NEFE. "However, allowing trusted individuals to take a closer look at your accounts can help you establish a realistic plan for the future, and help flag any potential concerns." Additional tools and resources are available at smartaboutmoney.org to help ensure your loved ones' finances stay healthy through these golden years. New dents, scratches and dings on your aging parent's car might be a sign of deteriorating driving ability. These are pretty obvious warning signs. With impaired financial decision making, the signs may not be quite as obvious, but if you know what to look for you might be able to spot it early. 1. Is the aging person taking longer to complete financial tasks? Does she struggle with everyday efforts like preparing bills for mailing, reconciling bank statements or organizing paperwork? 2. Is the person missing key details in financial documents? Are bills piling up and has he missed a payment? Is he able to prioritize his regular responsibilities? 3. Is your aging parent experiencing problems with everyday arithmetic? Maybe you recently went out to dinner with mom and dad, and while paying, they took an inordinate amount of time to calculate the appropriate tip. 4. 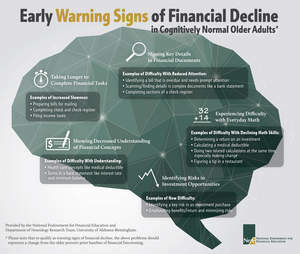 Have you noticed a decreased understanding of financial concepts with your loved ones? Are they having increased difficulty comprehending health care matters like deductibles, or are they having a hard time understanding the bank statements they receive? 5. Are they having new difficulty identifying investment risks? Are they able to minimize the risks in potential investments? Did they recently fall victim to fraud or a scam because they could not spot the liabilities?